a person whose job it is to write material for someone else who is the named author. 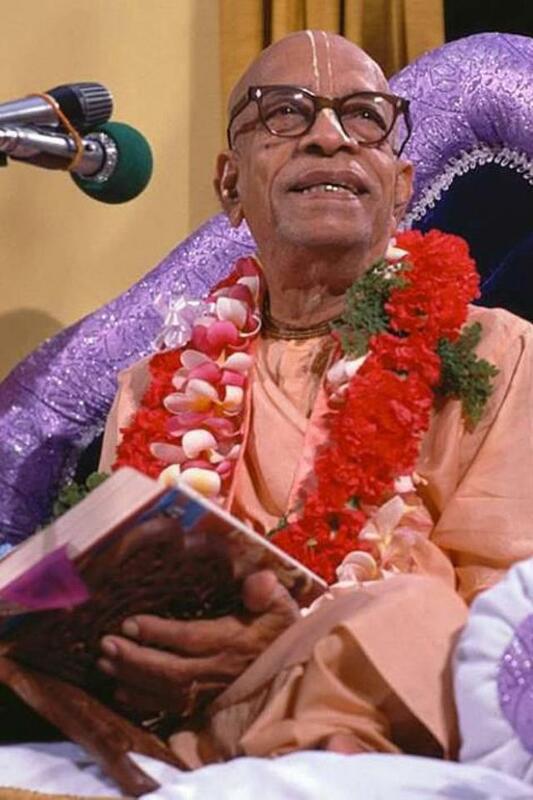 However, the difference between the usual ghostwriter and Jayadvaita Swami is that the latter is forcing his service upon the author (Srila Prabhupada), after the author’s demise. We got rid of the eleven self-appointed zonal “gurus”. But we still have Jayadvaita Swami who, as the self-appointed ghostwriter, is forcing his editing on Srila Prabhupada. Srila Prabhupada has no say in this regard. He is simply being forced to accept the ghostwritten material of Jayadvaita Swami. And so is everyone else. Please accept my respectful obeisances. All glories to Srila Prabhupada. I thank you for confiding in me on this subject. There is much to be said and I sincerely respect your concern. Actually, the subject is being discussed on the GBC level. The sacred principle of not changing what our Acarya has written is to be taken with great care. At the same time, the editorial process was done by persons who were personally trained by Srila Prabhupada. So it is not an easy subject. As it stands, it is being discussed on a high level of leadership. I do not believe that your separating from our society will have any positive result. There are many innocent and sincere devotees simply trying to be faithful to their seniors. I believe that Srila Prabhupada would want this issue resolved on a higher level of leadership, which I believe it will be in time, and that it not disrupt the lives of innocent devotees or the unity of our society. You have a right to your genuine concerns, please consider my appeal that you express it in a balanced way that preserves other sacred principles, those of respect and unity which Srila Prabhupada also emphasized as cardinal principles in vaisnava culture. We can see that Radhanath Swami is an intelligent diplomat. Radhanath Swami tries to maintain a relationship of trust. He makes it seem as if he appreciates Caitanya Candra Dasa’s questions, and invites him to open up his heart. This could make it seem as if Radhanath Swami has some special knowledge about the book changes, and as if it is a great mystery (secret knowledge) that requires deep and intense study, sadhana and special association to understand. But what Radhanath Swami is really saying, I guess, is that he does not know much about this matter, and that he is not going to speak much about it – neither to Caitanya Candra Dasa nor publicly. Radhanath Swami makes it seem as if he truly shares Caitanya Candra Dasa’s concerns. He speaks as if they are on the same side – that of genuine concern. But Radhanath Swami’s statement is trivial, for who does not care for Srila Prabhupada’s books? Everyone will say they care. Everyone will say that the editing should be done in a way that pleases Srila Prabhupada. But notice that Radhanath Swami does not disclose his own personal opinion. He really says nothing at all. But we all know what “a high level of leadership” in ISKCON means! It means incompetent devotees creating new problems while trying to solve already existing problems caused by themselves. And what is the proof that the GBC are talking about this? It was not mentioned in the GBC resolutions of 2015. Maybe Radhanath Swami is misinformed or twisting the truth trying to buy time. Or maybe there is really a committee of around 3 members who are all pro-change who speaks about the book changes 2 hours per year trying to figure out how to close the mouths of the protesters. 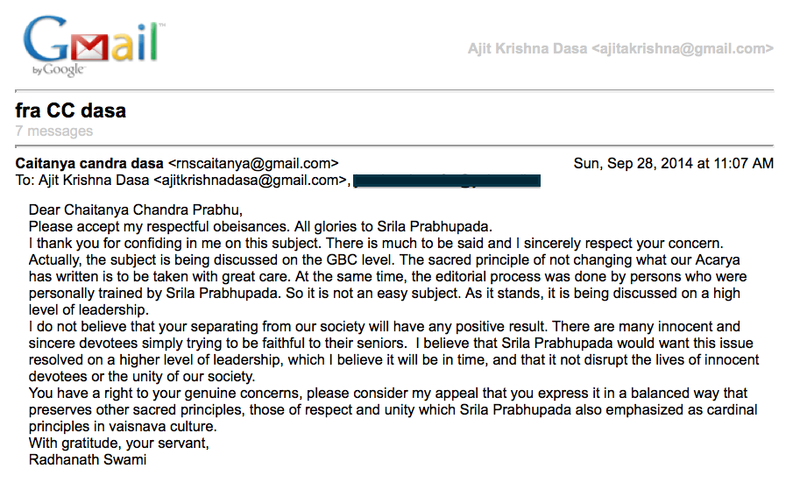 Why should we accept Radhanath Swami’s “assurance” that the GBC is handling this issue? For all we know he could be lying. He presents no proof. It really does not take much of a brain to see that Jayadvaita Swami and BBTI have violated the arsa-prayoga big time. But either Radhanath Swami will not write this online, or he is in denial or simply does not know much about what has been done to Srila Prabhupada’s books. What we do know is that he is diplomatic, and that he is not going to risk his own prestige and position by speaking about the book changes online or publicly. Factually, by his silence Radhanath Swami is accepting the changes made to Srila Prabhupada’s books by the BBTI, and by encouraging his disciples to also stay silent, he is also encouraging them to accept the changes. Radhanath Swami seems to have failed to understand that the so-called “higher level of leadership” in ISKCON has had more that 30 years to resolve this very simple issue. But they have continuously made the situation worse. Instead of stopping all editing while investigating the matter thoroughly they have allowed BBTI to continue editing many of Srila Prabhupada’s books. We have absolutely no reason to believe or trust that the BBTI or GBC are capable of solving this issue on their own. And since they will not listen we have to challenge them to answer publicly. There is no other way. It is their own fault that this subject is being debated publicly. And to claim that it is dangerous for new devotees to hear of such controversial topic is simply foolish. Our first concern in spiritual life is to make sure that the scriptures we read are bona fide. This is ABC and all new devotees are taught this in the temples, and it is written in all of Srila Prabhupada’s small introductory books. So if there is any doubt about the authenticity of the books, then all devotees need to know. The funny thing is that we know for sure that the original books are bona fide and have the power to deliver us. But we are not sure if the changed editions have that potency. As a guru Radhanath Swami ought to have at least the amount of intelligence to understand that we must stop printing the changed books until we know for sure which editions are bona fide. Better safe than sorry. But Radhanath Swami has never stepped forward to ask the BBTI to stop their editing while the matter is being investigated. Instead Radhanath Swami suggests that we leave this crucial matter to incompetent “high level leaders”, while we sleep our way back to Godhead. Are these foolish instructions on the book changes really coming from a bona fide spiritual master? RS: “You have a right to your genuine concerns, please consider my appeal that you express it in a balanced way that preserves other sacred principles, those of respect and unity which Srila Prabhupada also emphasized as cardinal principles in vaisnava culture. 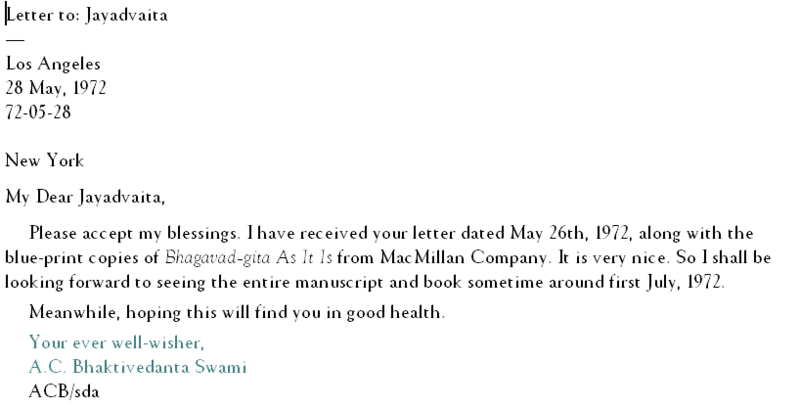 Radhanath Swami tries to close the correspondence in a mood of friendship. He has said something and at the same time nothing. Radhanath Swami prefers that Caitanya Candra Dasa keeps quiet about this matter and leaves it to the “high level leaders”. At the same time Radhanath Swami knows that Caitanya Candra Dasa might not want to keep his mouth shut, so he implores him to speak in a balanced way if he speaks about it. At no point did Radhanath Swami state his own opinion about the book changes, and he did not help Caitanya Candra Dasa understand this most important issue. If Radhanath Swami really was a bona fide guru, then he should easily be able and willing to clear the doubts of his disciples on this matter. But it seems he cannot do that. Or maybe he choses to let his disciples stay in the darkness of ignorance in order not to get himself into trouble. This is not how a guru works. A guru is not a diplomat. A guru is straight forward. A guru want to help his disciples. He wants to save them from ignorance and the offences of violating the arsa-prayoga principle. Some of our local ISKCON authorities in Denmark have tried to impress upon the Danish devotees that Caitanya Candra Dasa is violating his guru’s instructions by speaking about the book changes. But we can see this is false. Radhanath Swami says that Caitanya Candra Dasa has the right to be concerned about the book changes, and he does not prohibit Caitanya Candra Dasa from speaking publicly about the book changes – for whatever reason.